DXL has the capabilities to handle all phases of your new home construction project. We will meet with you to discuss all the possibilities for your new home during the design process, in order to gain a full understanding of your ideas and expectations for the project. 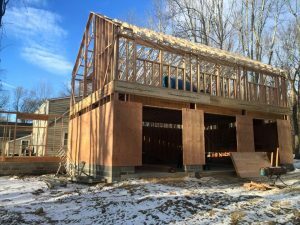 DXL has earned a solid reputation throughout Fairfield County as providing a superior home construction service. With certified experts in steel structure, welding, concrete, carpentry and masonry, the DXL Construction team has successfully completed a wide range of projects of all sizes and scope. Our construction team is very experienced and among the best in the business. As a result of our expertise, unforeseen issues that can arise during construction are minimized, which allows us to stay on schedule and within your estimated budget. We have long-standing relationships with all our subcontractors based on mutual respect and our many years of working together. We have extensive knowledge and experience in all phases of the construction. Because years of professional experience in the field, we have access to and can provide you with a team of contractors that can complete your project within your desired specifications. If you choose to have DXL Construction to act as your construction manager/general contractor, we will thoroughly explain all expenses, fees, and risks, and arrive at a final cost for your project that is reasonable, equitable, and within your budget.